I found this small scrap of rock while teaching my Rocks and Fossils summer camp this past week. 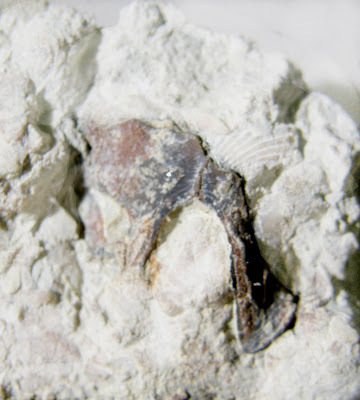 It was collected from the Decorah Shale in St. Paul. This fossil bed is a little over 400 million years old from when a shallow sea covered what is now Minnesota. More on that in a later post. The reason I had picked up this scrap was that it contains a trilobite tail. You can see it in the upper left hand corner of the photo above. It is the reddish fossil embedded in the rock. This is about half of a tail covering that shed as the trilobite grew. 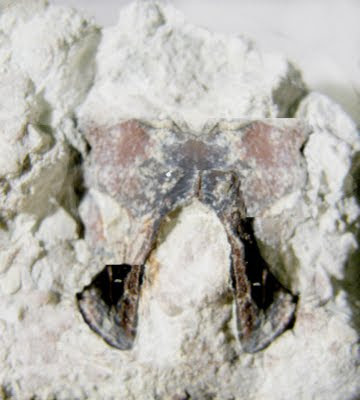 These shed pieces are far more common than finding the actual animal fossilized. This makes sense since each animal sheds many times the shed parts will outnumber the animals that shed them. They are pretty cool anyhow and I usually pick them up or give them to one of the kids. I decided to keep this one for some reason and slipped it into my pocket. I later looked at it under a low power microscope and marveled at all of the interesting other bits of marine life found in the specimen. There are some brachiopod pieces, bryozoans and even a crinoid ring. One structure caught my eye under magnification. It was something I had passed over as a bit of broken shell when looking with the naked eye. In roughly the middle of the photo there is a vaguely butterfly shape structure. I've isolated it in the photo below to make it stand out more. Under magnification I could see that while the top section was broken, the open part at the bottom was not missing. The arch-like structure is original. Whatever this was, it is supposed to be shaped like this. It is for sure not a broken shell. Not being able to make out what it could be I set it aside and went on to other tasks. Last night I was browsing around online looking for photos of trilobite tracks and I came across the wikimedia photo library of Mark Wilson, a professor of Geology at the College of Wooster. He has a fantastic collection of geology photos uploaded to the wikimedia commons including this photo of the hypostome (mouth plate) of the trilobite Isotelus. As soon as I saw that shape I knew it was very similar to what I had seen earlier in my specimen. Frustratingly, I had left the sample at work so I had to wait to compare. I did a restoration photo in photoshop tonight since parts are missing and they are symmetrical. Here's a slightly more complete view of the one I found with the corresponding parts from the other side added back in. You can see the similarity in shape but it is not the same. I think this is indeed a trilobite hypostome but perhaps from a different species. My sample is 15mm across total whereas the above one is about 85mm across. I don't know what species of trilobite this is from. There are three species listed as most commonly found at the Lilydale site. It seems the size would be most appropriate for Bumastoides milleri.